Affordable Fast Friendly Reliable Pickup and Delivery service. Auckland Metro , North Island Freight Profession­als. Moving Shifting of Household Items From Bedroom Furniture, to House Lot. Flat Removals.T­rade Me Pickup and Deliveries­. Auckland,H­amilton, Tauranga, Rotorua, Taupo,Whak­atane,Gisborne,Whangarei, New Plymouth, Palmerston North and Wellington­. All of North Island. Seven Days a Week 24/7 including Public Holidays. Late Evening Pickups and Delivery available . Moving Shifting around Auckland made easy with affordable Budget. Call me First for all your Moving Needs. All you need is provide Pickup and Delivery Address after Confirmation and Payment Method. For Shifting Bed Mattresses,Headboards, Tallboys,Chest of Drawers,Lounge Suites,Couches, Dining Suites, Coffee Tables,Chairs, Fridge Freezers,Office Furniture,TV,Entertainment Unit,Carpet,Sideboard, Car Parts, Building Materials you call me. Great Deals For Trade Me Single or Multiple Items Pickup And Deliveries. CRAZY SPECIAL FLAT RATE FOR HEAVY SINGLE ITEM FROM $40 PICKUP ANYWHERE IN AUCKLAND. Current special for Hamilton Taupo Raglan. Price Starts From $40 Single Item Delivery. Auckland to Hamilton, Rotorua, Taupo , Palmerston North, Wellington Pickup and Delivery specials. Urgent Pickup and Delivery Service available on the same Day. 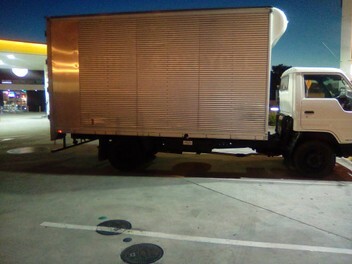 23 Cubic Metre Box Body Truck Hire From $60 an Hour with One Men. $90 with Two Men.Has 23 Cubic metre loading capacity. Minimum Two Hours Hire for Household Move.extra Men from $25 an Hour. Callout Fee $30. 35 Cubic Metre Truck with One Men $90 an Hour Inclusive. Two Men with Truck $120 an Hour Inclusive. Minimum Two Hours Hire .Extra Men from $25 an Hour. Callout Fee $40. We go extra mile for customers needing late evening pickup and delivery. Note: Get Quotation or pricing first before Confirming. Call me on Ph:0210310365 For Fast Pickup And Delivery Service Even if it's Urgent. looking for Backloads From and To Auckland, Hamilton, Raglan, New Plymouth, Wanganui, Palmerston North, Wellington, Tauranga, Thames, Whakatane,Gisborne, Hawkes Bay,Masterton. Backloading Auckland to Wellington Weekly. Unbeatable Backloading deal for North Island. Aukland to Wellington Backload Deal: $1,800 Inclusive 23 Cubic Metre Truck. Auckland to Wellington Backload Deal: $2,300 Inclusive 35 Cubic Metre Truck. Hi there, you said okay to a job yet you have NOT completed the delivery. What is going on? Both myself and the person have been waiting for pickup / delivery. I'm not sure what you are doing but this is frustrating for the customer. Please at least provide an update? I will amend this feedback if resolved. Prasad: Hi Tony You have to Understand your enquiry for Pickup was from Napier to Auckland whereas exact pickup was close to Dannevirke. Single item pickup is only possible if our time matches as this was one off Backload pickup. Great service - Cheap price, quick response, very friendly. Highly recommend. Prasad: Anytime you are my another happy customer. Thanks a lot. Very friendly and efficient service. Prasad came to pick up the corner chaise I bought from one of the big furniture store. As it was not on display and size was not mentioned in the website I told Prasad that it will fit in the van.But it was too big for the van.So he went back and got another truck to pick it up and did not charge anything extra for it.Also he recycled my old sofa just to help me. I would surely recommend him to anyone who want to use his excellent service.Thanks Prasad. Prasad: Thanks for the kind feedback, this is what i like doing best making my customers happy. Excellent service - Quick response, punctual, reliable and affordable.And fully met my requests. Would definitely use again and highly recommend to others! Prasad: Anytime at your service, thanks for the feedback. Great experience, very helpful especially when we had a last-minute request. Would definitely use again! Prasad: Call me anytime for my service. Your feedback means a lot. Thanks. Prasad: Thanks for your feedback really appreciated. Prasad: Thanks a lot. Call me for my service anytime. Prasad: Your feedback and choosing me to serve you means a lot. Thanks again.